Oil shale resource areas of Utah, Colorado, and Wyoming. The recent increase in energy prices has spurred renewed interest in the development of liquid hydrocarbons from oil shale deposits, including those in Utah. In addition to significant deposits in the United States, over 20 major deposits of oil shale are known from various countries around the globe. Beginning as early as the 1830s, some limited development of oil shale has taken place in Australia, Brazil, Canada, China, Estonia, France, Scotland, South Africa, Spain, Sweden, and Switzerland. Past efforts to recover oil from these shale deposits have generally been economic only when less expensive conventional oil deposits were not available. However, the interest in non-conventional oil sources like oil shale has grown with the increasing demand for oil in Asia and the rest of the world, and as questions have arisen whether the world’s conventional oil supply is headed into a long-term decline in productive capacity. So where does Utah fit into the energy picture with regard to oil shale? The distribution of oil shale deposits in the world is not uniform: the Green River Formation of the western U.S. contains more than half of the world’s oil shale resources. 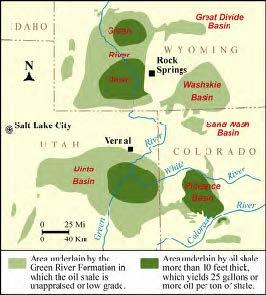 The Green River oil shale deposits are some the thickest and highest grade in the world, and the oil-bearing intervals can be over 130 feet thick and yield more than 25 gallons per ton of rock. Northeastern Utah, northwestern Colorado, and southwestern Wyoming are estimated to contain about 1.5 trillion barrels of oil in the Green River Formation (see map and table), about 72 percent of which underlies land owned by the federal government. The Utah portion of the Green River oil shale resource is estimated at 499 billion barrels of oil, while Colorado holds 700 billion barrels, and Wyoming has about 300 billion barrels. Thus, some future tests of new oil shale technology will probably occur in Utah, and if oil shale should become economic to develop, Utah will likely be one of the first places to see development, too. The oil shale deposits of Utah accumulated about 50 million years ago in a lake (called Lake Uintah) that covered an area larger than the present-day Uinta Basin. Organicand lime-rich mud deposited in the center of the lake forms the present-day oil shale. The organic material preserved in the oil shale is not oil, but a substance called kerogen that can be heated in a process called “retorting” to produce oil and gas. To date, no technology for producing oil from oil shale has proven commercially successful in Utah or elsewhere, but testing has occurred on two basic types of oil shale processing technology. One involves mining the oil shale first and then heating it in a surface retort to produce the oil; the second involves heating the oil shale in the ground and extracting the produced oil through wells. Shallow oil shale deposits around the margin of Utah’s Uinta Basin are probably best suited to mining and surface-retort production of oil, while the deeper oil shale deposits are better suited for in-ground heating and oil production. Several companies are presently taking another look at the economics of extracting oil from the shales of the Green River Formation, but great uncertainty exists over the long-term oil price forecast, and whether the forecast includes a sustained period of high prices needed to promote oil shale technology development. In addition to pricing issues, other questions about oil shale leasing and environmental regulatory issues need to be resolved before large-scale oil shale development could take place. Thus, large-scale development of oil shale deposits in Utah is at least 5 to 10 years into the future. The UGS is putting together an oil shale information database for the state of Utah that will be available on the UGS Web site in February 2006. This database will include Fischer Assay data, formation tops information, and geophysical logs. For more information contact David Tabet (801-537-3373; davidtabet@utah.gov) or Mike Vanden Berg (801-537-5419; michaelvandenberg@utah.gov).